While fallout from the US subprime mortgage crisis is wobbling many housing markets, at the top of the property scale it seems the world’s big spenders have been blissfully unaffected. When it comes to luxury, residential real estate has never had it so good. “The market for high-end residential real estate is very, very strong at the moment," said Dan Walsh, a group consultant with Grosvenor, an international property development and fund management company in London. “Although I expect some moderation in the next six months, in London, in China and all across Asia you are seeing the market responding to the enormous accumulation of wealth that is going on—and this is a phenomenon that is not going away." Russian oil and natural gas billionaires, Chinese and Indian entrepreneurs, and an army of financial intermediaries constitute this growing class of high-end buyers, said Liam Bailey, head of residential research for the Knight Frank real estate agency in London. Bailey’s annual wealth report for 2007 shows that although the price of luxury homes has never been higher, demand for them has been surging. “In 2006, prices for the most expensive global property went up around 14% on average, while the housing market overall went up around 9%. That gap has continued this year, too." One of the main locations where this is happening is London, which Walsh described as being “in a class of its own." “You are seeing record prices for prime Central London property these days," said Jim Ward, research director for the Savills real estate agency in London. “In the last 12 months there has been 29% price growth for this class of residential real estate in the capital. For this, the £5,000 (Rs4 lakh) per sq. ft barrier has also now been breached." One project that illustrates the overall trend is One Hyde Park, an 80-apartment address designed by the architect Richard Rogers and being built in the Knightsbridge part of the city. Earlier this year, some of its best units were expected to sell for £4,000, or $8,060, per sq. ft—but expectations have risen since then. When the project is completed in 2010, One Hyde Park will consist of four connected buildings adjacent to the Mandarin Oriental Hyde Park hotel, which will provide some services for the development. Publicity from the development managers, Candy & Candy, is emphasizing the project’s luxury and big-name style, qualities that generally are agreed to be absolute musts for upscale residential projects worldwide. “The design trend globally is definitely towards places with an iconic architect and good branding," Bailey said. “A lot of the traits of hotel design, which has long been slightly ahead of the curve, are coming over into high-end residential, with concierge, cleaning, security and other services essential." Design is also something keeping New York in the high-end game, even if other segments of the US housing market are suffering. Bailey said that in places such as West Asia, “there are a lot of big developments but it all tends to be a bit formulaic. In New York City though, there are a lot of smaller projects that nonetheless score highly on the design side." Projects like the Blue Tower on Manhattan’s Lower East Side, designed by Bernard Tschumi, fit this category, while also extending the recent streak of innovative developments like Columbus Circle and Tribeca Tower. Another city with new projects that aim for design-conscious investors is Tokyo. “The market there has been quiet for years as the Japanese economy overall has suffered," Walsh, of Grosvenor, said. “That’s changing now though as the recovery kicks in, creating a severe shortage of high quality residential propertyin central Tokyo." Research by KEN Data and Grosvenor shows that in Tokyo’s nine central districts, high-grade residential apartments—those of more than 90 sq. m, or 970 sq. ft, and renting for more than $3,000 (Rs118,800) a month—saw a 4.3% rise in rental rates in 2006, while from April 2006 to April 2007, the increase on super luxury properties reached 8%. In the same period, property values shot up by 30%. As a benchmark, the Japanese economy overall is showing flickering growth of 2- 2.5%. One very high-end project causing waves in Tokyo is the Yoyogi Park development, a 45-apartment residential block designed by the British architect Paul Davis and expected to be completed in fall 2008. Units will be 150-350sq. m each and are expected to tear up the city’s previous price tags, which ranged from $1,700 to $2,000 a sq. ft for luxury properties at the start of this year. Meanwhile, the Asia-Pacific region has seen impressive high-end residential growth this year. “Across Asia Pacific, demand for high end is very high," said Darien Bradshaw, regional director for Colliers International in Hong Kong. “While Perth in Australia was massive, it’s now tailing off, while cities such as Sydney and Melbourne are beginning to pick up. “But the real hot spots in the region at the moment are Macau and Singapore. In the latter, we’ve seen a 100% increase in prices over the last two years. Meanwhile, in Macau, the deregulation of the casino industry and all the hotel and conference business associated with that have really driven up demand and prices," Bradshaw said. 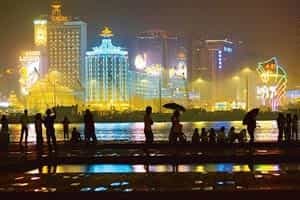 The Macau benchmark was set by One Grantai, which sold its top-end apartments for 7,000 Macanese patacas (Rs35,129) a sq. ft. Colliers’s research shows the number of residential real estate transactions in the city also jumped 120% between the first quarter of 2006 and the first quarter of 2007. When it is finished in 2010, One Grantai will sit midway along the city’s Tai Tam Hill, and its 856 apartments will cover six high-rise blocks and have a range of facilities, from pools to saunas and cinemas. “There are really two types of buyers here," Bradshaw said. Individuals, and “private property funds, which are buying up en bloc these days in cities like Macau and Shanghai, but also elsewhere. If you build a three- or four-tower residence in Kuala Lumpur, for example, two or three of the towers will be bought off plan by one of these funds and the rest will be sold to wealthy individuals." The strength of the upscale residential market is also likely to continue, say most brokers, although for how long is a question mark. “It’s not always a straight line upward," Bailey said. “In London, for example, between 2002 and 2005, high-end residential property underperformed the rest of the London real estate market. There’s always an element of risk at the high end, particularly in cities where the wealth depends a lot on financial markets, such as London and New York. “Yet, if you look at who is buying now, it’s often people from India, China and Russia, economies that are largely unaffected by the capital markets. They want their trophy assets too, with price hardly a factor. That builds in a lot more stability to demand."